Get hooked Hooks on the back of the door can be used to store bathrobes, purses, scarves and other accessories. Consider hanging a shoe rack too. Double up You can literally double your storage space by installing another hanging rod for short-hanging items. Move it up High spots are good places for out-of-season items (like ski gear and hiking stuff) or special occasion shoes and accessories. Sort it out Always hang shirts, skirts, blouses and light sweaters. For maximum organization, group similar articles of clothing together, unless you’re a stickler for grouping by colour. 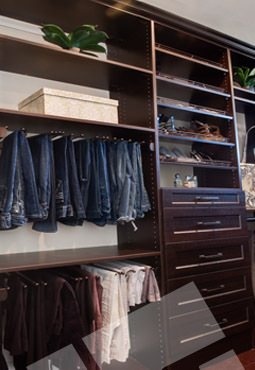 Make it accessible Fold t-shirts, jeans and bulky sweaters and stack on shelves. Put no more than ten items in a pile (three to five for bulky sweaters). That way, when you grab a piece of clothing from the bottom, you won’t collapse the pile. Box it in Boxes are also a good place to stash accessories. Roll up ties and pairs of gloves, and keep them on an accessible shelf so you can easily pull the entire box out and view all your options. Put a label on each box (unless you have an incredible memory). Shelve it A 14-inch-wide shelf not only allows clothing to rest comfortably, but it’s also broad enough to hold baskets and bins for accessories and gym gear. Adjustable shelves are ideal — you can change their height and add or remove them as needed when rotating seasonal items, such as sweaters. Arrange it Arrange products and supplies according to how you use them. Anything you regularly need should be within easy reach; place extras and incidentals on a high shelf or another out-of-the-way spot. Downsize it Decant detergents from large boxes and jugs into smaller containers or soap boxes; refill as needed. Store it Store small supplies in boxes or bins. Place stain-removal products in one, sewing materials in another and sponges in a third. Have rags on hand for spills. Sort it Sort whites, colours, delicates, and heavily soiled items in bins or tilt out laundry hampers. Dry it off Keep a drying rack handy for drip-dry items. Iron it Get a hidden ironing-board so the board and iron are secure and out of the way but easily accessible. Hang it up Install hanging space in the laundry room on which to hang clothes as you iron or install an adjustable valet rod to the wall to use when ironing. Supply it Keep clothes hangers and mesh bags for delicates with your cleaning supplies or in a nearby cabinet. Use it Use free space in the laundry room to store gift wrap, ribbon, basic tools and pet supplies. Label it Mark each shelf with labels that denote the contents of each area of the shelf (i.e. canned goods, baking ingredients, etc.) Note it As you organize, take note of items you may need to buy or replace. Make a shopping list for these items and be sure to leave room for them on the shelves. Sort it Small items like soup mixes and bouillon cubes can be kept together in plastic containers. Non-food items can be stored on the floor or lower shelves (i.e. paper products). Store it carefully Soda bottles and other heavy items can also be stored on the floor or on low shelves. Hang it Consider mounting wall hooks or a pegboard to hang items like kitchen cloths and cleaning equipment. Basket it up Roll-out rattan baskets are an excellent way to keep your fruits and vegetables stored.